*This post is sponsored by Cost Plus World Market, all thoughts, opinions, and shark bait – are of my own accord. With the kids being home all Summer long, I have had to think of a few fun ideas to keep the boredom at bay, and keep the kids outside. The #WorldMarketLove4Outdoors ideas have been AHhhh-Mazing (you should be checking them out by following that hashtag on social media). 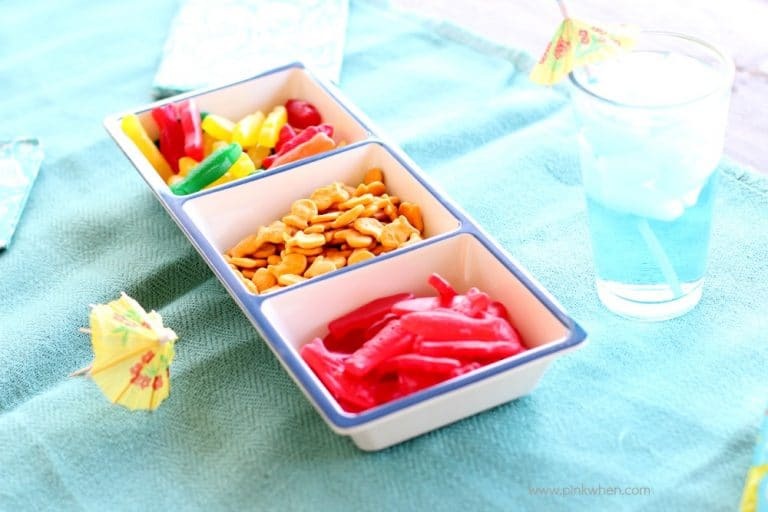 I decided to join in on the fun and create this kid friendly and fun Summertime Shark Party. It wasn’t hard to do, and EVERYONE loved it. I set the ambiance with some beautiful aqua colored pieces that gave us land lovers a feel of being closer to the beach. 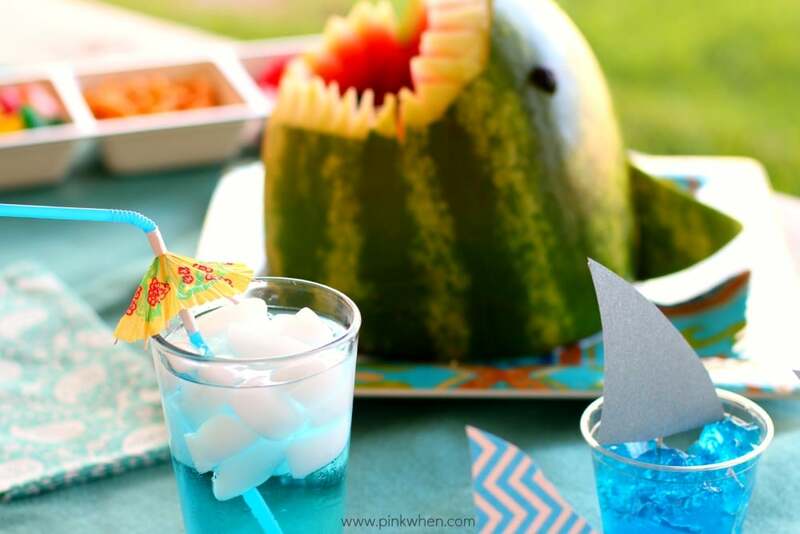 Check out how we brought this SHARKTASTIC Summertime Shark Party Idea to life.! 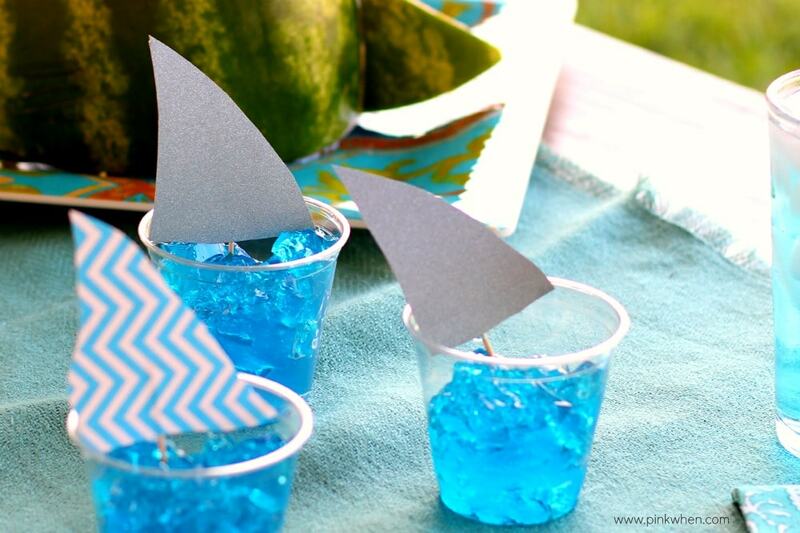 To get started I created the jello, scooped it into the clear cups, and added the little shark tails. 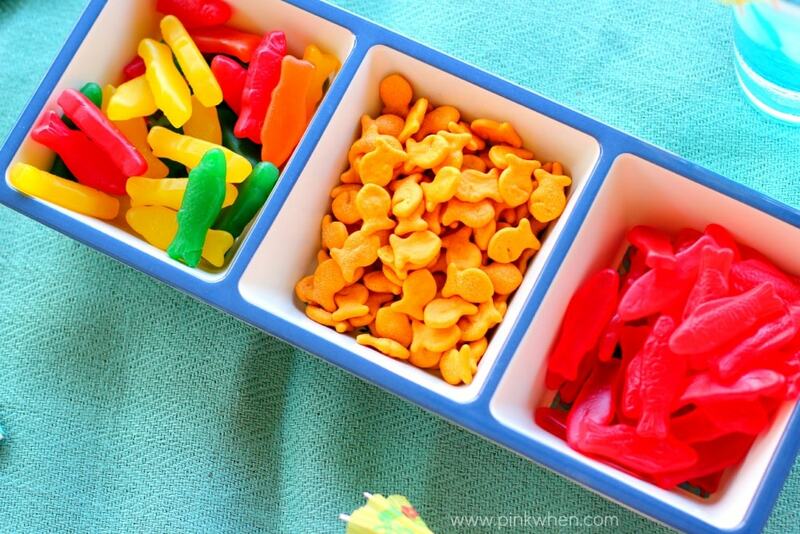 Once those were complete, I added the appetizer tray and placed the gummy fish, gold fish crackers, and fruit on the tray for serving. For the final piece, I created the fun Watermelon Shark and placed it on the large square serving tray. The shark was actually not too hard to create, and I even have a video to share with you on how I made it. After I carved the shark, I created a couple of deep set holes and added blueberries for the eyes. 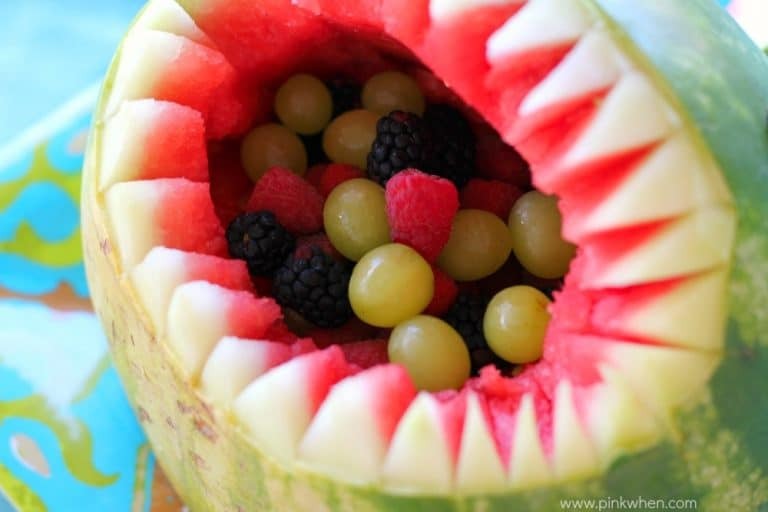 I then filled the cavity with chunks of watermelon, raspberries, blackberries, and grapes. Once all of the sharktastic (see, I said it again) ideas were in place, it was time to dig in and have fun. 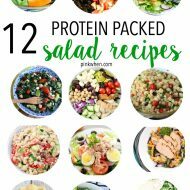 If you are having a birthday party, swim team party, or just a fun Summertime barbecue with the neighbors, this is a surefire way to bring you closer to the ocean. Even if you are land locked like we are! 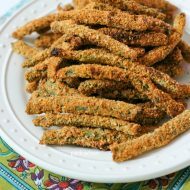 Looking to host a Summertime party? Check out these ideas from World Market for other party ideas, food and drinks, and different collections to make hosting your party perfect. How about a party tip! Check out this tip from Katie Riley: Fill a large drink dispenser with sparkling soda or juiced infused citrus for a sweet summer refresher. World market also has a Summertime Getaway Sweepstakes with FOUR Grand Prize packages. 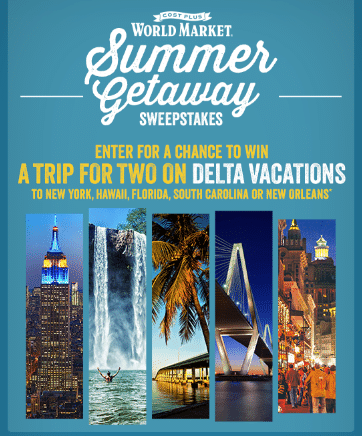 Win a trip for two on Delta Vacations to your choice (should you win) of Florida, Hawaii, South Carolina, New Orleans, or New York. It also includes hotel accommodations and a $500 Cost Plus World Market Gift Card. CLICK HERE to enter to win! Whether you decide to throw a Summertime Shark Party or any other fabulous Sumer party – just make sure you enter to win with World market before June 19, 2015! It would be perfect to watch both Sharknado movies at a party like this! Awesome stuff. I don’t believe the shark is celebrated near enough. What an awesome idea for a party! 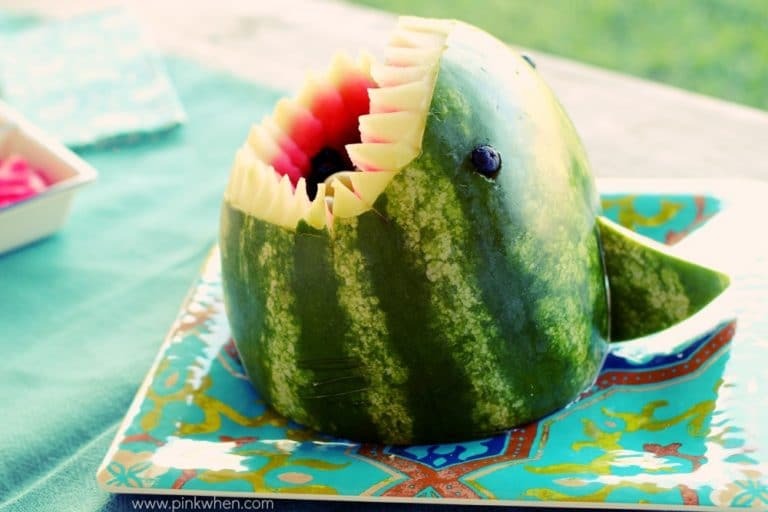 Love the shark melon! 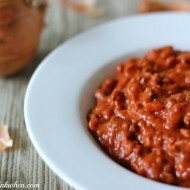 Thank you for sharing with us at Brag About It! Hope you will share with us again next week! this is such a cute idea! 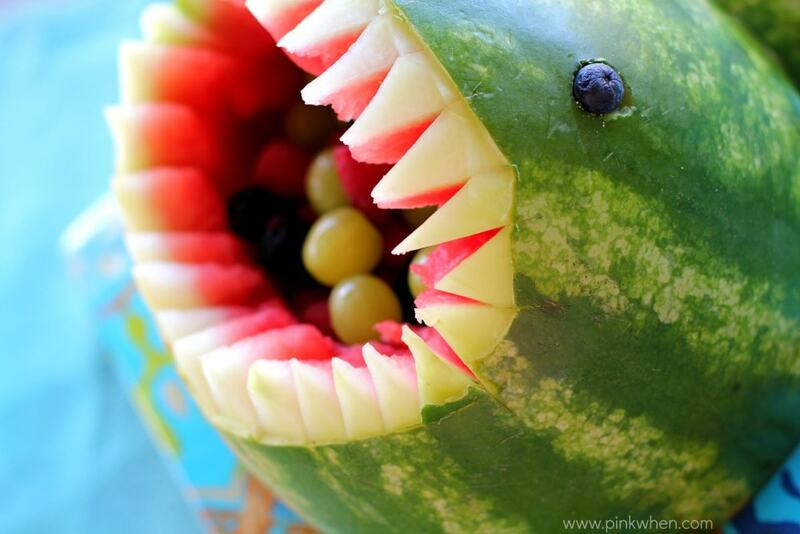 love the watermelon shark!! This is so adorable I submitted it to be featured next week on #HomeMattersParty Thanks so much for sharing! !